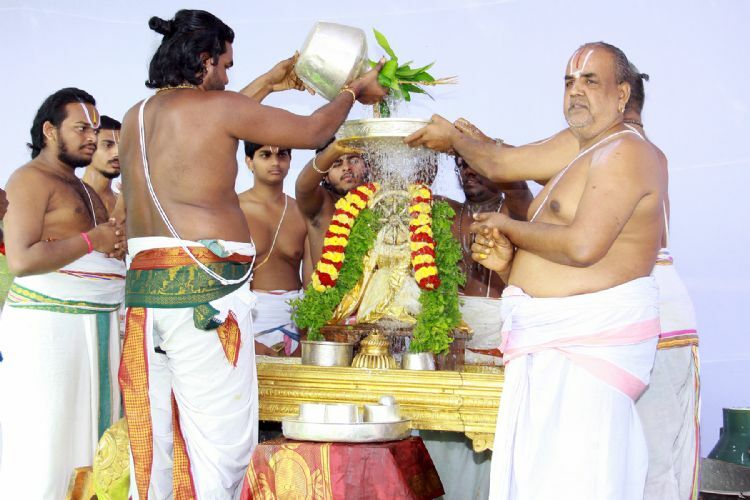 Tirumala, 9 January 2017: In connection with auspicious Vaikuntha Dwadasi, Chakrasnanam to Sri Sudarshana Chakrattalwar is performed with religious fervour in Tirumala on Monday. The Chakrattalwar was taken on a procession from Srivari temple to Swamy Pushkarini and Holy bath was rendered between 4:30am and 5:30am. The Varaha Puranam describes 66 crore punya Teertham in Tirumala of which Swamy Pushkarini Teertham occupies prime and pride place. It is the official temple tank of Hill Shrine. Hence the Dwadasi Chakrasnanam is also known as Swamy Pushkarini Teertha Mukkoti.